I'm getting a lot of reading done while I'm staying at my friend's house (ten days while she's in the South of France). 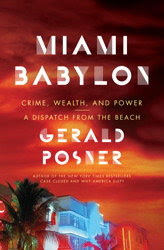 I'm now reading Miami Babylon and can't put it down. It full of Miami Beach history (which I love) as well as dirt about everybody. A lot of the dirt is stuff everyone knew but nobody was brave enough to put in print before. It's a good read and a must for anyone who lives here. Since today is Columbus Day I'm taking it easy even though I have three deadlines this week. I can't believe it's already the middle of October. I'm putting money away for Christmas because I must go home and see my family this year. Last year I declared poverty and couldn't afford the trip but there's no excuse. I must go this year even if I have to pawn my camera (again).